← No Volunteer Orientation Tonight! SBK will be closed Thursday-Saturday this week, November 24th-26th. We will resume regular hours Tuesday, November 29th at 6pm. 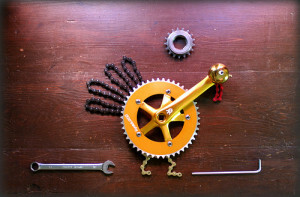 On Turkey Day, SBK volunteers will be out with the mobile fixery at the Appetite Enhancement Ride at the Front Street Auto Museum. This year’s fundraising will be donated in support of the #NODAPL Standing Rock protesters; hope to see you all there!